the Lightlift 33.17 Performance IIIS tracked aerial platform! The Lightlift 33.17 is the tallest model in the Performance IIIS range and reaches a maximum height of 32.6 m, in addition to a maximum side outreach of 16.5 m. The Performance jib features a ± 90° rotation angle and special structure, allowing it to easily overcome obstacles at height (Up&over 17 m) and offer negative work capabilities. The compact structure is also an important feature of the Lightlift 33.17 Performance IIIS model which measures just 5.8 m in length without the basket and special swivel support. The basket, with a working load capacity of 230 kg without restrictions for the entire work diagram, features a 180° (± 90°/-90°) rotation angle. It is wide and spacious (1.600 x 700 x 1.100 mm), giving operators ample manoeuvring and recovery space for all equipment used at height. The lower transport height is 2 m (1.99 m with the plates installed) and allows the platform to easily access the inside of buildings and to cross industrial and civil doors. The stabilisation area varies: 4.6 x 5.1 m when fully extended and 3.3 x 6.3 with limited outreach. When in reduced stabilisation mode, this machine can turn 360° and operate non-stop at a constant speed, with a 10.5 m side outreach. The open/closed undercarriage width is 1.200/1.700 mm. The working weight of the platform, which can climb a maximum gradient of 16° (28.7%), is 7.616 kg. The stand-out feature among the various technological innovations incorporated in the Lightlift 33.17 Performance IIIS model is the “Go-Home” function. By automatically closing and aligning the telescopic booms, it increases the stowing position speed and excludes any errors which might occur during this operation. The Lightlift 33.17 Performance IIIS model can be equipped with a Kubota D902, 3-cylinder diesel engine, plus a 380V/50Hz electric motor. Alternatively, there is an optional lithium-ion battery pack which guarantees zero-level emissions as well as noise-free, low environmental impact. The platform is, therefore, suitable for use in closed areas or where there is poor air exchange, guaranteeing excellent working autonomy and speed of movement. The “intelligent” functions featured in the Lightlift 33.17 Performance IIIS tracked platform - which can automatically switch from transport to working position - also include the synchronised (or simultaneous) opening of the main boom and telescopic boom. The latter automatically extends while the main boom is lifted, so the operator is lifted in a more intuitive manner. Both movements of the main boom can be executed in sequence with a single joystick: lifting and extending. 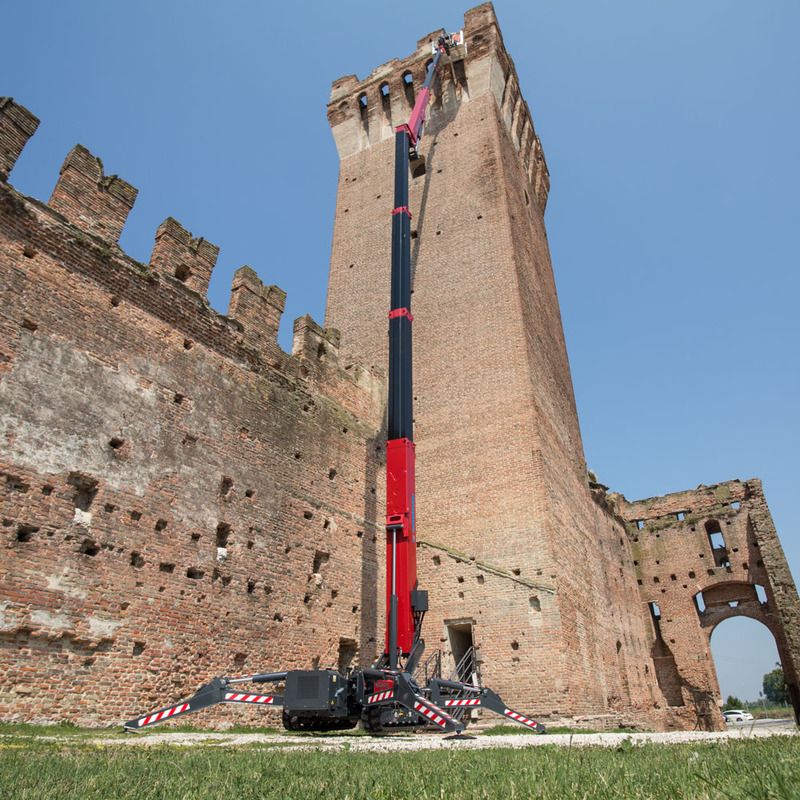 Hinowa has added a variety of enhanced features to the Lightlift 33.17 Performance IIIS model. An example? Fast closing of the machine with a quick return to the ground. There is no need to completely close the platform to return the basket to the ground, thanks to the negative work capability of the main boom. All the multi-extensions are with ropes and not chains, fully housed in the booms for greater protection and reduced maintenance, even the catenaries are inside the booms. The Lightlift 33.17 Performance IIIS tracked aerial platform features a new bigger remote control with a colour display and new SmartVision LCD panel for ground controls on which you can view all the platform information, operational instructions and user manual.